About 10,000 migrants were rescued off the coast of Libya over the previous four days but at least 54 others died, Libyan and Italian officials said Saturday. 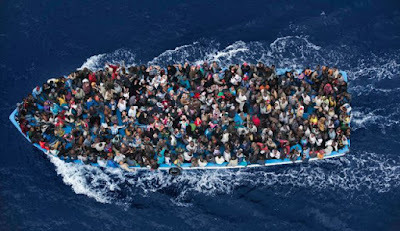 On Friday, more than 1,200 migrants were rescued by Libyan ships and taken to Tripoli or Zawiya, about 50 kilometres (30 miles) west, while the Italian coastguard and commercial boats rescued 2,200 others and took them to Italy. The unloading of passengers in Sicily was halted all week due to the G7 summit in the eastern hilltop town of Taormina, which lengthened rescue ships’ journey by 24 hours and delayed their return to the seas. While migration and the vast continent on Sicily’s southern doorstep got a mention Saturday in the final statement of G7 leaders gathered in the hilltop town of Taormina, the summit itself was dominated by trade, climate change and security threats. Summit host Italy had made Africa a priority for the gathering, picking Sicily as a venue as it was “at the heart of the Mediterranean” and a “bridge between Europe and Africa,” according to Prime Minister Paolo Gentiloni.